Fleas. The very word makes you want to scratch, right? Unfortunately, pretty much all domestic pets are likely to suffer from at least one flea infestation during their lifetime. These tiny, wingless parasites are difficult to spot, spread extremely quickly and can affect the humans as well as the animals in your household. Therefore, making sure that you take adequate preventative care is essential if you are to minimize the risk of an infestation affecting your home. Many pet owners, especially those who are new to pet parenting, mistakenly believe that if their pet lives predominantly indoors, they do not need to worry about preventative treatment. Wrong! Fleas may be small, but they are surprisingly capable when it comes to finding a host and infiltrating someone’s home! How can my Indoor Pet contract Fleas? Here are some of the more unusual ways in which fleas can make themselves comfortable on your indoor pet. - If you have any other outdoor animals in your home, they could bring fleas inside, where your unprotected pet provides an ideal all-you-can-eat buffet for them. - A secured outdoor area might prevent your pet from getting out, but it won’t stop any fleas from getting in. These little parasites can jump a surprisingly long way, so if any wild or neighborhood animals who are infected happen to come close by, fleas could make their way into your secure space where they can come into contact with your pet. - Fleas are just as willing to hitch a ride into your home on a human family member. If you happen to visit a place with fleas, they could easily attach themselves to your shoes or clothing. - If your furbaby has to visit a veterinarian he/she may come into contact with other animals who could potentially be carrying fleas. Fleas live off the blood of their host. This means that they need to bite into your pet’s skin. Unfortunately, flea saliva is extremely irritating, and many pets and humans are allergic to it. Humans and animals with flea allergy dermatitis may develop a rash around the affected area, which flares up in response to flea saliva. Even in hosts that aren’t allergic, flea bites often become swollen, itchy and red. Thankfully, this makes them much easier to spot on humans, and those people with flea infestations in their home normally find that their feet, ankles and calves become covered in bites. Scratch too hard or too much and these can quickly become infected. Flea infections can cause your pet to experience a number of health problems, especially if they are not dealt with promptly. 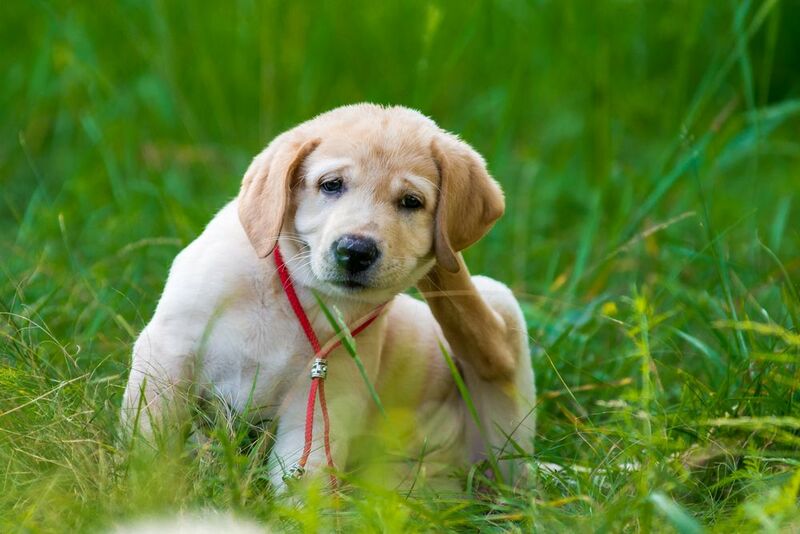 In addition to skin irritation and possible infection, fleas can put your pet at risk of anemia. Fleas can consume up to 15 times their own bodyweight in blood, so a severe infestation could cause a young or small animal serious and even life-threatening blood loss. Flea infestations are one of the worst types of external parasite to deal with, as they are notoriously difficult to remove. Fleas can live anywhere from 13 days to 12 months and have the ability to produce millions of offspring. To completely deal with an infestation, it is necessary to treat infected animals, deep clean any flea-infested areas and source preventative measures to protect your pet and home from future flea problems. Before you arrange any preventative treatment, it is essential that you check that your indoor pet doesn’t already have a flea infestation, and that there are no fleas present in your home. Fleas are very small, usually around 2.5mm small. This can make them difficult to spot, particularly as they are a reddish brown in color, and try to secrete themselves in the deepest, furriest parts of your pet’s body. It can also be difficult to see any flea bites on animals with very long or thick fur. Most owners find that it is much easier to spot something known as ‘flea dirt’. This looks like regular, dark-colored soil or dirt in your pet’s fur but is actually flea feces, which primarily consists of dried blood. The way to check if it is regular dirt or flea dirt is to put a small amount on a piece of tissue and wet it. If it spreads out and is red in color then it is flea dirt. While treating your animal is obvious, many people don’t realise that they also need to thoroughly remove any fleas from their home if they are to prevent re-infestation. This can be easier said than done, as fleas also prefer to lurk in the depths of your soft furnishings where just a regular vacuum will not reach them. Instead, you will need to do a ‘deep vacuum’ of any areas where your pet goes, getting right into the grooves of the skirting, between and under sofa cushions and between the folds of fabric in your curtains. When you have finished vacuuming, remove and seal the bag and throw it out immediately. This will prevent any surviving fleas from escaping. We strongly recommend repeating this process over the course of a number of days, alongside using home flea treatments to completely eradicate the infestation. There are a wide variety of different flea prevention treatments currently on the market. However, this doesn’t mean that all of them are right for your pet. Our veterinarian is the best person to ask for advice as to which preventative is most suitable for the breed and size of your furbaby. Our vet can also arrange a schedule of preventative care which will help you to ensure that your beloved animal is protected all year every year. Contact us and schedule an appointment with our veterinarian for further advice.